NEWTON — Even by the admittedly high standards of West Newton Hill, the historic Queen Anne-style home nestled on Chestnut Street looks like a stunner. Listed for sale at just under $2.7 million, the circa-1855 home features 13 rooms, an exterior framed by a piazza, and a central turret offering a wide view of the front yard. The two-and-a-half story home sits on nearly an acre — a rare prize in land-starved Newton. And thanks to sky-high values for residential property, the land may be more valuable if a future owner has the choice to knock it down and build something new. The property’s owner, Mordechai Hodis, is close to a deal for the property at 128 Chestnut St., but the deal is contingent on the buyer having the option to alter, move, or demolish the house, said Mitchel Bernstein, a real estate agent with Coldwell Banker. But a group of residents and city officials are calling for the Newton Historical Commission to designate a “local landmark” status on the house to block any possible demolition. Laura Foote, a neighbor and member of the West Newton Hill Preservation organization, said the group opposes demolition of the house. The Newton Historical Commission is scheduled to decide on the landmark proposal Thursday, May 24, at 7 p.m. in City Hall. Hodis opposes the move, and has already spent hundreds of thousands of dollars working on the house, Bernstein said. And the amount of work that still needs to be done has been a deterrent to potential buyers. The home features six baths, six bedrooms, a half-dozen fireplaces, and hardwood floors throughout, according to the listing. It has been up for sale for 346 days, Bernstein said. Hodis dropped the asking price by $100,000 for the property in February from $2.79 million to $2.69 million, according to the listing. The Chestnut Street home is on the market at a time of soaring real estate values for residential properties in Newton: the median single-family home selling price has ballooned from $760,000 in 2005 to more than $1 million in 2015, according to The Greater Boston Housing Report Card, written by Northeastern University and published by the Boston Foundation. And with the rising cost and scarcity of housing in greater Boston, and Newton in particular, developers and property owners look to maximize the value of land, said Greg Vasil, CEO of the Greater Boston Real Estate Board. Hodis purchased the property with his late wife in September 2010 for $1.75 million, according to records on file with the Middlesex Registry of Deeds. Since that time, the city assessment on the property has ballooned from about $1.6 million to more than $2.3 million by fiscal 2018. Hodis asked permission from the Historical Commission to knock the house down more than two years ago. The board ordered demolition be delayed until July 2017. Since the expiration of the demolition delay, Hodis has until July 2019 to apply for a permit, said Katy Hax Holmes, Newton’s senior planner. And due to a quirk in the city’s rules, if the Chestnut Street property is sold before then, a new owner won’t have to go through another demolition delay period, she said. City officials have since changed that rule after seeing historic property owners obtain a demolition permit with the intention of increasing a property’s value during a sale. “When we changed the ownership provisions to make it non-transferrable during a demolition delay period, it actually took the market speculation out of the [demolition] application process,” said Holmes. Tear-downs of existing homes — and then replacing them with substantially larger houses or luxury townhouses — is common in Newton, according to a 2016 city report. And after old homes are knocked down, the houses taking their place can be much bigger: Single-family homes built in Newton before 2005 averaged 2,389 square feet, while those built from 2005 to 2014 averaged more than 4,000 square feet, the report said. 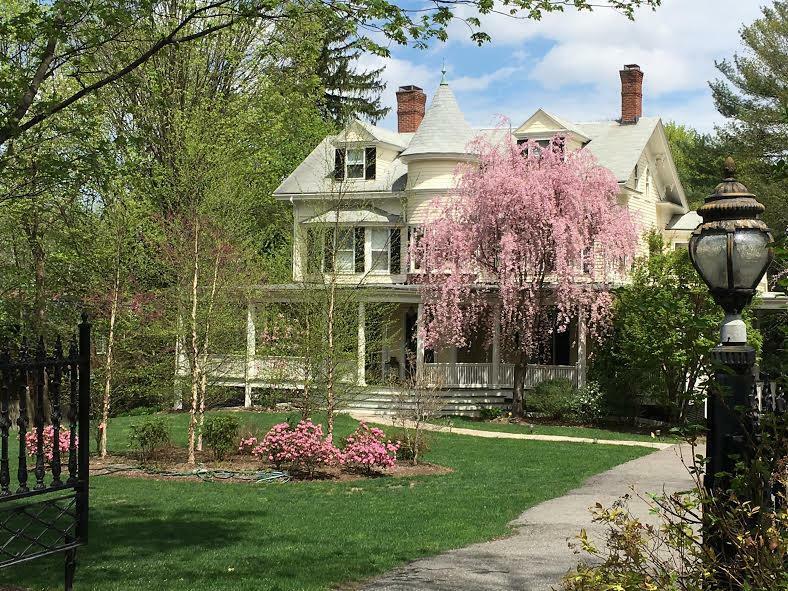 The West Newton Hill organization led an unsuccessful effort last year to establish a local historic district in West Newton, similar to ones in Auburndale, Chestnut Hill, Newton Upper Falls, and Newtonville. The Chestnut Street house was originally built as a farmhouse and was expanded into a Queen Anne style in 1900, including the prominent central turret, according to a report prepared for the Newton Historical Commission. The home is known primarily for two of its past owners: Henry Calvert Lambert, an ardent abolitionist and retired Unitarian minister from East Cambridge; and Frederick E. Jones, a Boston leather merchant. The home is also listed on the National Register of Historic Places.